Charles Leclerc (ART Grand Prix) scored his third victory of the season today in the GP3 Series race at Spa-Francorchamps. The Monegasque driver extends his championship lead ahead od Alex Albon, who finished ninth. The podium was completed by Jake Dennis (Arden Motorsport) and Nyck De Vries (ART Grand Prix). Leclerc started the race from pole and stayed in front during the 17-lap race at the famous 7-km long Grand Prix circuit. 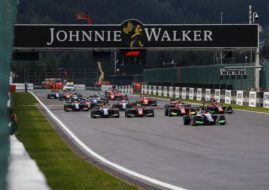 Nyck De Vries moved from third to second at the start, ahead of Antonio Fuoco, while Jake Dennis made the biggest improvement through the field, progressing from 13th to fourth. Jake Hughes, who started from the second position on the grid, was the victim of the crash at Turn 1, together with Matt Parry, who started sixth. The Safety Car was out for three laps. After the restart, there were no changes in the leading five positions until Lap 14. Jake Dennis then attacked Fuoco for P3. A lap later, he took the P2 from De Vries. Fuoco finished fourth, ahead of Steijn Schothorst.